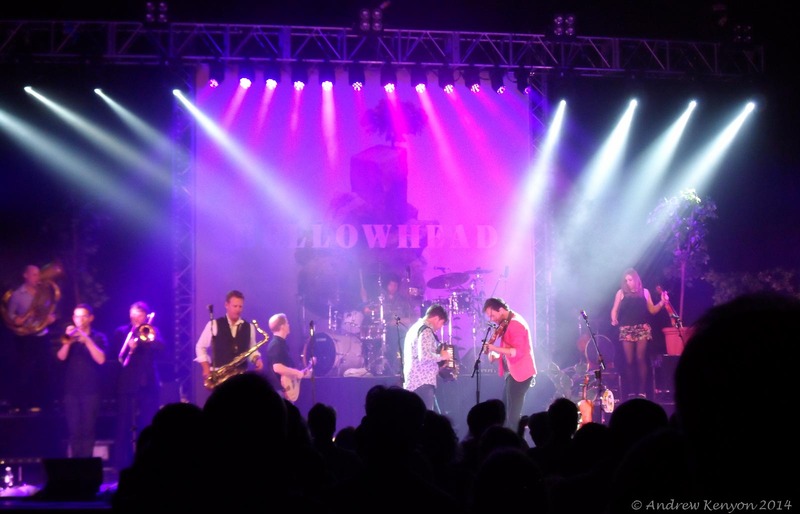 Bellowhead have not really been on my radar before. I knew of them and vaguely of their music but that was it. A couple of weeks ago I heard them on the BBC Radio 2 Folk show and liked what I heard but thought nothing more of it. Yesterday afternoon a tweet popped into my timeline from the Southend Cliffs Pavillion saying there were a few seats released to see them that night. It seemed a good idea and at £24.50 for a good seat I took the plunge. Pretty glad I did. They were absolutely brilliant. The format of the show was a two half affair with no support and a 30 minute interval which I liked alot. I hate having to wait hours for the main event to come on stage so this worked for me. The band arrived in style at 8pm behind a curtain onto which was projected the title of their new LP Revival. In keeping with their country feel the sound of a throaty tractor starting up and revving behind the curtain announced the start of the show. Reaching a crescendo the curtain dropped to reveal the eleven piece band on the stepped stage which was complex and simple at the same time. The back of the stage was dominated by a banner with the graphic from the current album in front of which was drummer Pete Flood standing among his assorted drums and percussion. Stage left were the brass section of Andy Mellon on Trumpet, Ed Neuhauser on Helicon (curly horn thing), Justin Thurgur on Trombone, and Brendan Kelly on Saxophone & Reeds (I presume the stretch sax thing he was playing). In case the boys got tired a comfy leather sofa was handily available for them and used at intervals through the show. Stage right were the strings section with Sam Sweeney on Fiddle, Paul Sartin on Fiddle and Oboe (I thought it was a clarinet – what do I know eh), and Rachael McShane on Fiddle and Cello (I got that one right). Holding fort centre stage was squeezebox player John Spiers who very ably played mostly a lovely Melodeon plus a Concertina, and Jon Boden on Fiddle and Tambourine. Last but by no means least was Benji Kirkpatrick who variously played Guitar, Bouzouki, Banjo and Mandolin in virtually all positions from vertically to horizontally. Jon Boden lead the vocals but I think every member of the band sang at some stage. The overall effect of the vocals and instruments was incredible. I did think Jon’s vocals on the opening song Let Her Run was a bit loud but it improved after that and the rest was perfect. The majority of the tracks were introduced by Jon or John with some explanation or tenuous tale or other which was great fun. 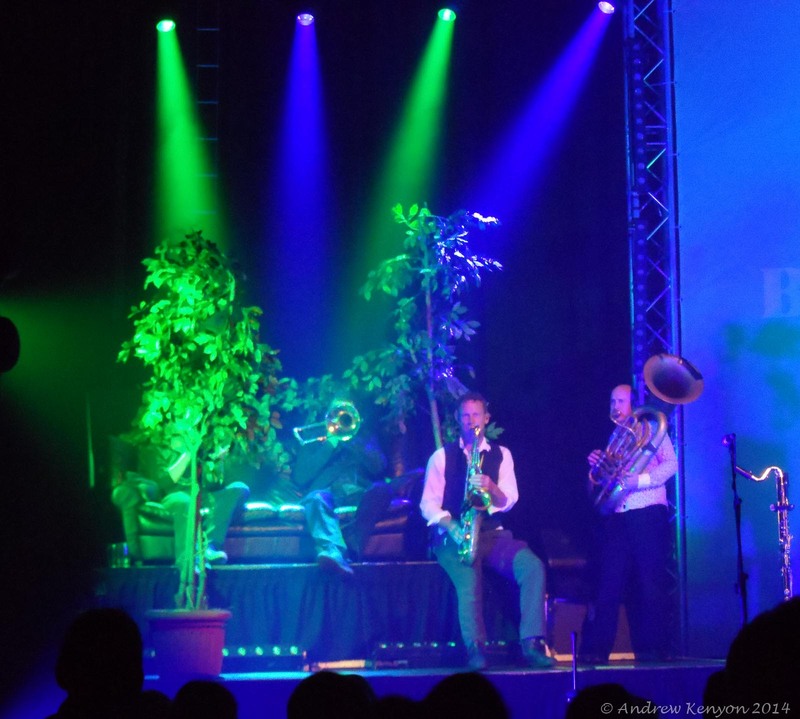 All the songs were performed with enormous energy and theatrics with crowd participation encouraged throughout. One frustration was being seated and the reluctance of people to get up and dance. A few brave people started to stand at the start of the second half but it wasn’t until the last few songs that the whole audience finally got to their feet for a boogie. Being unfamiliar with the majority of the songs – of which some 21 were performed – was not a problem. All the songs were very easy to pick up being both simple in their rhythm and complex in their musical arrangement but great to move along to seated or otherwise. The combination of voices and instruments was truly fantastic. I particulalry liked Betsy Baker in the first half. Songs from the new album Revival were liberally sprinkled through the show including The excellent Gosport Nancy (amongst others) in the first half and Roll Alabama and Rosemary Lane in the second. There were tracks too from Broadside and Burlesque plus the ten year old London Town which was fab. There were some great solos and memorable moments including the brass section straying into James Bond music at one stage and leading some ‘Jazz Hands’ shenanigans on Let Union Be, plus the brilliant Captain Wedderburn which started with just Jon fiddling then a fiddle duet with Jon and Rachael and built with much fiddle plucking to the full band before finishing on a pluck – exceptional. In the end I managed to take quite a few photos mostly during the second half of the show. The venue were pretty hot on people taking photos (they were the night before when I was also there to see David Gray) but come the second half loads of people were taking photos so I joined in. I managed to make my way to the front to capture the gang in action close up. I’ve included a few on here and the whole set can be found on google+ here. The second half finished up with the excellent New York Girls with much dancing in the stalls and aisles before the band left the stage. The obligatory – and much deserved and welcomed – encore soon came with Roll the Woodpile Down and finally Frogs Legs and Dragons Teeth. I loved everything about this gig and it ranks among the best I have ever seen and just reinforces my love of live music in small venues. I shall be getting hold of the back catalogue and eagerly awaiting the next tour. 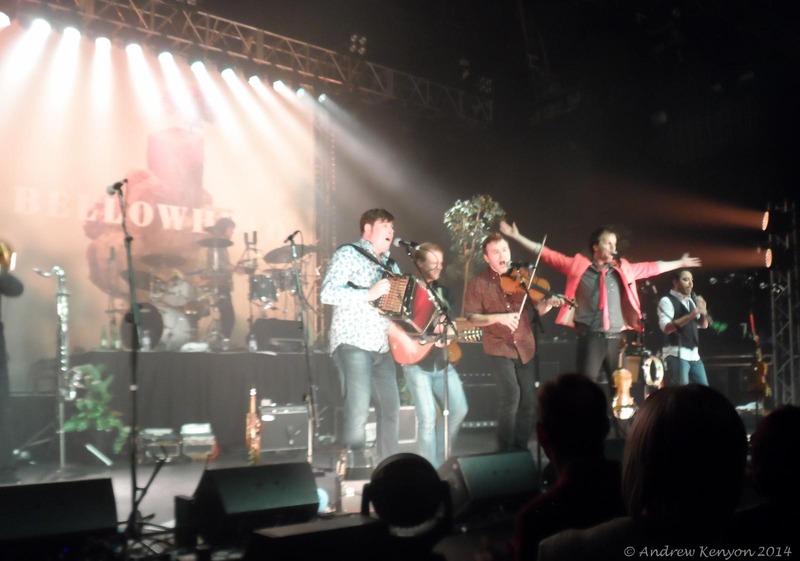 If you ever get the chance to see Bellowhead live then do so – you will not be disappointed. Oh – and unusally for me in recent times – I bought a T shirt during the interval which I wore for the second half. The band and many of the band members are on twitter and it has been great to be able to thank them for the great show and get their appreciation for that from them – the way it should be. Thanks guys. 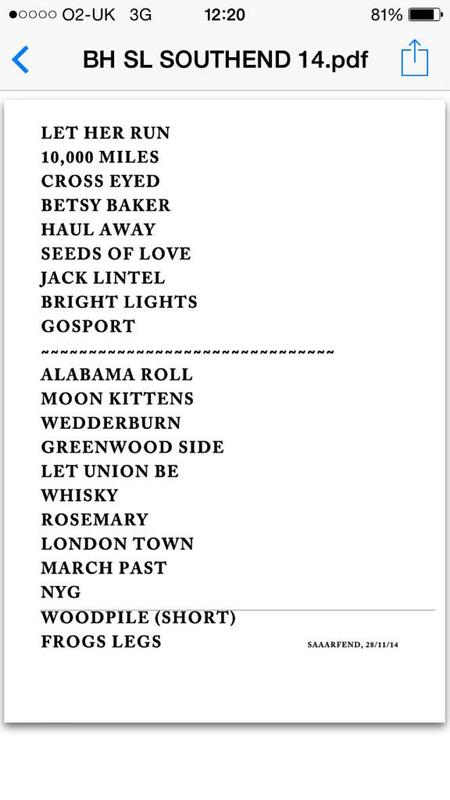 The full setlist was kindly provided by Andy Mellon is included below.